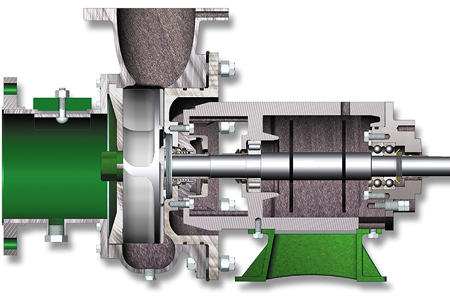 The Vaughan E-Series Horizontal End Suction Centrifugal chopper pump is ideal for process applications such as municipal sludge transfer, RAS, WAS, digester mixing and recirculation through heat exchangers. The chopping process maintains sludge consistency and homogenization while eliminating any clogging issues. The E-Series design allows complete external adjustment of all cutter clearances. Vaughan's patented cartridge mechanical seal eliminates the need for expensive water flush systems, while the optional stuffing box design is available for flushed mechanical seal or packing.